#1. This week's number one is an international point guard Facundo Campazzo (181-91, currently plays in Spain). He led Real Madrid to a victory over the 12th-ranked Blusens Monbus (11-15) crushing them 94-70 in the Spanish Liga Endesa in Sunday night's game. Campazzo was MVP of the game. He scored 15 points, had 5 boards, passed 9 assists and added 3 steals in 25 minutes on the court. Real Madrid (21-5) is placed second in the Liga Endesa. It was his team's seventh consecutive victory in a row. This year Campazzo averages: 9.8ppg, 2.6rpg, 5.0apg, 1.1spg, 2FGP: 44.4%, 3FGP: 27.8% and FT: 89.9% in 25 games he played so far. He is currently a member of the Argentinian senior national team. #2. Second place goes to an international forward Nicolas Brussino (202-93, currently plays in Spain). Brussino could not help CB Canarias (13-13) in their last game on Sunday. Despite his very good performance CB Canarias was defeated 91-87 on the road by the higher-ranked La ICL Manresa (#6). Brussino was the second best scorer with 19 points. He also added 4 rebounds. It's Brussino's first season with the team. Brussino's overall stats this year are: 5.4ppg, 2.2rpg, 2FGP: 45.2%, 3FGP: 38.0% and FT: 80.8%. He is in the roster of the Argentinian senior national team. #3. The Argentinian player who performed third best last week abroad was an international small forward Patricio Garino (198-93, college: GWU, currently plays in Spain). Garino was the major contributor in Baskonia's victory against the eighth-ranked Andorra (14-14) 84-82 in the Spanish Liga Endesa on Saturday night. He scored 12 points and grabbed 5 rebounds in 25 minutes. Kirolbet Baskonia Vitoria (20-6) is placed third in the Liga Endesa. It was his team's sixth consecutive victory in a row. This year Garino's overall stats are: 6.7ppg, 1.9rpg, 1.5spg, 2FGP: 76.7%(23-30), 3FGP: 38.9% and FT: 75.0% in 14 games. He is also a member of the Argentinian senior national team. #4. Guard Luca Vildoza (190-95, currently plays in Spain) is a teammate of previously mentioned Patricio Garino. But that was another game of his team in Spanish Liga Endesa which we would like to mention. Vildoza contributed to Baskonia's victory against one of league's weakest teams UCAM Murcia (7-19) 86-75. He scored 11 points and added 5 passes. Kirolbet Baskonia Vitoria (20-6) is placed third in the Liga Endesa. It was his team's sixth consecutive victory in a row. Vildoza's total stats this season are: 8.9ppg, 1.7rpg, 2.8apg and 1.5spg. He is also Argentinian national team player. #5. International guard Nicolas Laprovittola (190-90, currently plays in Spain) contributed to a 3-point Joventut's victory against the 11th-ranked Burgos (12-15) 88-85 in the Spanish Liga Endesa on Sunday night. He scored 17 points and added 4 assists. Divina Seguros Juventut Badalona (14-11) is placed seventh in the Liga Endesa. Laprovittola has individually a very good season with high stats. He averages: 16.7ppg, 2.2rpg and 6.2apg. Laprovittola plays currently for the Argentinian national team. #6. Point guard Franco Balbi (185-89, currently plays in Brazil) contributed to an easy victory against the sixth-ranked Corinthians (12-14) 92-73 in the Brazilian NBB on Saturday night. Balbi recorded 7 points, 6 rebounds and 12 assists in 27 minutes. Clube de Regatas do Flamengo (22-4) is placed first in the NBB. It was his team's 11th consecutive victory in a row. Balbi has relatively good stats this year: 10.1ppg, 3.7rpg, 5.9apg and 1.8spg in 27 games. He is an international player who is currently on the senior Argentinian National Team roster. #7. International forward Gabriel Deck (199-95, currently plays in Spain) is a teammate of previously mentioned Facundo Campazzo and both played together in the last Spanish Liga Endesa game. Deck managed to help Real Madrid to win against the 12th-ranked Blusens Monbus (11-15) crushing them 94-70. He scored only 2 points and grabbed 5 rebounds. Deck's total stats this season are: 4.8ppg, 3.1rpg and 1.1apg. He is also Argentinian national team player. #8. Guard Juan Fernandez (193-90, college: Temple, currently plays in Italy) contributed to a 1-point Alma TR's victory against the closely-ranked Sidigas AV (14-12) 97-96 in the Italian Serie A last Tuesday. Fernandez recorded 9 points and added 3 assists in 17 minutes. Alma-Agenzia Per Il Lavoro Trieste (15-11) is placed fifth in the Serie A. It was his team's fourth consecutive victory in a row. There are only four games left until the end of the Regular Season. So now every game will be critical. This year Fernandez's total stats are: 9.7ppg, 1.6rpg and 2.8apg in 25 games. He used to play for the Argentinian national team back in 2014. #9. Former international center Daniel Amigo (208-95, college: Denver, currently plays in Hungary) was not able to help DEAC (13-14) in their last game. Despite Amigo's very good performance the third-placed DEAC (13-14) lost 81-91 in Sopron to the lower-ranked (#4) Sopron KC in the Places 6-10 group. He had a double-double by scoring 22 points and getting 11 rebounds in 35 minutes; quite an impressive performance considering it's only Amigo's third season in pro basketball. It was DEAC's third consecutive loss in a row. This year Amigo has relatively solid stats: 11.5ppg and 5.9rpg in 26 games. He is a naturalized American. Amigo used to play for the Argentinian national team two years ago. Strangely he has never played in Argentina. #10. Point guard Lucio Redivo (183-94, currently plays in Spain) was not able to secure a victory for Leche Rio Breogan (8-17) in their game against FC Barcelona (22-4) in the Spanish Liga Endesa. Redivo scored 9 points and added 3 passes in 27 minutes. But Leche Rio Breogan was badly defeated 92-75 in Barcelona by the leading FC Barcelona. Redivo has reliable stats this year: 10.5ppg, 1.8rpg and 2.3apg in 24 games. He is an international player who is currently on the senior Argentinian National Team roster. #11. International center Marcos Delia (211-92, agency: Best of You Sports, currently plays in Spain) is a teammate of previously mentioned Nicolas Laprovittola and both played together in the last Spanish Liga Endesa game. Delia contributed to a 3-point Joventut's victory against the 11th-ranked Burgos 88-85. He scored only 4 points. Delia has averaged so far 5.0ppg and 1.9rpg. He plays currently for the Argentinian national team. #12. An experienced former U17 international small forward Leandro Bolmaro (198-0, currently plays in Spain) couldn't help Barca II (9-22) in their last game on Sunday. Despite Bolmaro's good performance Barca II was defeated 69-65 in Valladolid by the higher-ranked Carramimbre (#9). He was the second best scorer with 11 points. Bolmaro also added 4 rebounds and dished 3 assists. Bolmaro averaged so far 10.5ppg, 3.2rpg, 2.4apg and 1.3spg. He used to play for the Argentinian U17 national team back in 2017. #13. Former international point guard Juan Pablo Cantero (184-82, currently plays in Portugal) couldn't help Benfica in their game against FC Porto in the Portuguese LPB. Cantero cannot count Sunday's game as one of the best ones. He scored only 3 points and added 6 assists. His team was defeated 84-79. Cantero has averaged so far 7.0ppg, 1.7rpg and 4.9apg. He used to play for the Argentinian national team nine years ago. #14. Former U18 international shooting guard Enzo Ruiz (193-88, currently plays in Brazil) contributed to an easy victory against the eighth-ranked Minas crushing them 85-64 in the Brazilian NBB last Monday. Ruiz scored only 3 points in 19 minutes. Ruiz averaged so far 10.4ppg, 3.2rpg and 2.0apg in 28 games. He used to play for the Argentinian U18 national team back in 2006. #15. Former international small forward Carlos Delfino (198-82, currently plays in Italy) couldn't help Consultinvest BO (24-5) in their last game. Despite Delfino's good performance Consultinvest BO was badly defeated 94-78 in Cagliari by the much lower-ranked (#13) Cagliari DA in the East group. He scored 10 points in 19 minutes. Delfino has averaged so far 7.0ppg, 2.3rpg, 1.7apg and 1.3spg in six games. He used to play for the Argentinian national team three years ago. #1. Experienced Andres Forray (187-PG-86, currently plays in Italy) led Dolomiti En. TR to a victory against one of league's weakest teams VL Pesaro (7-19) 81-76 in the Italian Serie A last Sunday. Forray scored 16 points in 28 minutes. Dolomiti Energia Trento (15-11) is placed sixth in the Serie A. It was his team's third consecutive victory in a row. There are only four games left until the end of the Regular Season. So now every game will be critical. Forray has been at the team for eight years. This season his total stats are: 6.6ppg, 1.9rpg and 1.7apg in 25 games he played so far. Forray has a dual citizenship: Argentinian and Italian. #2. Ariel Filloy (189-PG-87, agency: Interperformances, currently plays in Italy). He could not help one of league's weakest teams Sidigas AV (14-12) to beat Banco di Srd (14-12). Filloy scored 9 points and added 7 passes in 25 minutes. But Sidigas AV was crushed 105-84 on the road by the higher-ranked (#7) Banco di Srd. It was Sidigas AV's fourth consecutive loss in a row. There are only four games left until the end of the Regular Season. So now every game is very crucial. This year Filloy's total stats are: 9.1ppg, 4.0rpg and 4.2apg in 22 games. He is another player who holds two passports: Argentinian and Italian. #3. Albano Chiarastella (199-F-85, agency: Octagon Europe, currently plays in Italy) contributed to an easy victory against the ninth-ranked Benacquista LT (14-13) crushing them 84-59 in the Italian Serie A2 (second division) last Sunday. 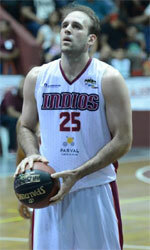 Chiarastella recorded 8 points, 13 rebounds and 4 assists. Edilnol Pallacanestro Biella (15-12) is placed seventh in West group. It was his team's fifth consecutive victory in a row. They will play only one more game in the Regular Season. And now that game is quite important. Chiarastella's total stats this season are: 4.5ppg, 6.4rpg and 2.1apg. Similarly like Filloy and Forray above he has both Argentinian and Italian nationalities. #4. Marcelo Dip (205-C-84, agency: Players Group, currently plays in Italy) led Deco to a victory over the fifth-ranked Olimpia Matera (19-9) 84-70 in the Italian Serie B (third division) on Sunday night. Dip was the best player in that game. He scored 19 points, grabbed 7 rebounds and dished 3 assists. Deco Caserta (26-3) is placed first in Group D. It was his team's fifth consecutive victory in a row. They will play only one more game in the Regular Season. This season Dip has relatively solid stats: 10.9ppg, 7.3rpg and 2.2apg. Similarly like three previous players above, he also holds two passports: Argentinian and Italian. #5. Nicolas Ferreyra (185-PG-85, currently plays in Chile) was not able to help Deportivo Valdivia (20-12) in their last game on Wednesday. Despite Ferreyra's good performance Deportivo Valdivia (#2) was defeated 81-72 in Ancud by the lower-ranked AB Ancud (#4) in the Conferencia Sur. He scored 13 points and added 4 passes (went 6 for 6 at the free throw line). Ferreyra has individually a very good season with high stats. He averages: 15.3ppg, 2.5rpg and 6.3apg. #6. Bruno Cerella (194-G/F-86, also represented by Players Group, currently plays in Italy) was not able to secure a victory for Umana Venezia in their game against Happy Casa BR in the Italian Serie A. Cerella cannot count Sunday's game as one of the best ones. He recorded only 3 points. His team was defeated 71-65. This season Cerella averages just 1.0ppg. He has dual citizenship: Argentinian and Italian. #7. Bernardo Musso (193-G-86, another player represented by Interperformances, currently plays in Italy) contributed to a 2-point Novipiu Casale's victory against the fifth-ranked Bergamo Bsk 89-87 in the Italian Serie A2 (second division) last Sunday. Musso scored 16 points and added 5 assists in 24 minutes. Musso averaged so far 12.6ppg, 3.8rpg, 3.3apg and 1.5spg in 26 games. He holds both Argentinian and Italian passports. #8. Mario Jose Ghersetti (201-PF-81, currently plays in Italy) was the main contributor in a Pompea MNV's victory against the seventh-ranked Unieuro Forli 81-66 in the Italian Serie A2 (second division) in Sunday night's game. Ghersetti was the best player in that game. He scored 20 points in 29 minutes. Ghersetti averaged so far 10.5ppg, 4.3rpg and 1.2apg in 28 games. Similarly like Musso and Cerella above he has dual citizenship: Argentinian and Italian. #9. Enzo Cafferata (187-PG-88, currently plays in Brazil) managed to help Mogi das Cruzes/Helbor to win against the 12th-ranked SKY/Basquete 77-69 in the Brazilian NBB last Saturday. Cafferata recorded only 4 points. Cafferata has averaged so far 5.3ppg, 1.3rpg and 2.0apg. #10. Enzo Damian Cena (200-F/C-92, currently plays in Italy) faced previously mentioned Marcelo Dip in the Italian Serie B last game. Cena couldn't help Olimpia Matera (19-9) in their last game. Despite his very good performance Olimpia Matera (#5) lost 70-84 at home to the leading Deco in the Group D. Cena was the top scorer with 15 points. He also added 8 rebounds in 33 minutes. Cena averaged so far 14.0ppg, 7.3rpg, 1.6apg and 1.4spg in 25 games. He has Argentinian and Italian nationalities.